Yesterday Shadow, Wilma, and I Adventured to Colt State Park in Bristol, Rhode Island. Colt State Park is a 464 acre Park along the Narragansett Bay. It includes: trails, playing fields, a museum, a dock for fishing, a boat launch, and an outdoor concert area. We had a frigid Adventure to Colt State Park yesterday spending almost three hours on the trails. This was our second visit to this Park as Shadow, Buster, and I had visited in August of 2015, on a warm summer day. Yesterday was a quiet day for visitors, with a few dedicated walkers, runners, and of course our fellow dog lovers. We began our afternoon walking on a paved path that weaved through fields, and tree-filled areas. There were picnic benches throughout and views of a marsh-like areas. The trail looped around before arriving at Narragansett Bay. We spotted the Bay ahead before arriving at a scenic bridge. After spending time exploring the shore beside the bridge, we headed across and over to the Bay side of the trail. The Bay’s shore was rock filled, many of the covered with ice. The bright blue water shimmered in the sun, while the wind adding nature’s texture. We strolled over and down the dock to check out another view before continuing along the Bay. The path eventually brought us to a rocky, shell-filled beach-like area. We spent some time exploring this area and relaxing from our steady walk. Wilma enjoyed hopping on the rocks and chewing on some sticks, while Shadow seemed quite pleased just being at the “beach”. We located a large wooden pole stating “Bristol”, causing great intrigue. A little too cold to sit and relax on this chilly day, however, lovely memories flooded my heart of a laying on the “beach” area with Shadow and Buster. A special moment on that summer day almost four years ago. After enjoying this “beach” location we headed back to the car, the wind quite arctic on our faces. We took a slightly different route back, stopping to view a statue along the way. Poor Wilma did not appreciate this dedication, but of course added some humor to our day. It was one of those days I would probably not have ventured out if I was not motivated by the amazing Shadow and Wilma. So glad to enjoy an Adventure on this chilly winter day. I have included a collage mixed with photos from both of our trips as well as several videos below (Rating: 3). 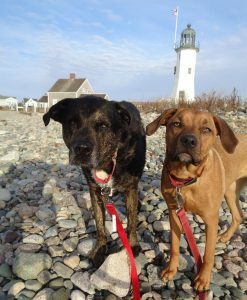 In April 2015 Shadow, Buster, and I journeyed to Cliff Walk in Newport, Rhode Island. Sadly Buster has passed away since, but he definitely enjoyed his share of adventures. He was an amazing boy, and will always be missed. Cliff walk is a 3.5 mile trail that borders the shoreline. It is a National Recreation Trail in a National Historic District. Cliff Walk runs behind some of the mansions in the area, and includes: tunnels, paved paths, rocky shoreline, and beach areas. We decided to choose one of the first spring weather days to journey to Cliff Walk. It was still a “winter-dark” kind of day, yet spring was in the air. We enjoyed walking on this picturesque trail, on the paved trail, through the tunnels, and onto the shore. It was neat to see such unique structures, and architecture on our walk, combining with the gorgeous rocky shoreline. We even found a nice, quiet area to picnic on the rocks. I am sure the walk is even more beautiful when the green color, and flowers are out in the spring in summer. However, it was nice to avoid the tourists, crowds, and to relax enjoy this gorgeous location. I think I will plan a visit again in the future (Rating: 4). I will have sections of my blog that I will title “Flashback Adventure”, and will plan on posting them every Thursday. These are journeys we have taken before I started the blog, but are well worth sharing. In August 2016, Shadow, Buster, and I journeyed to the Beavertail State Park in Jamestown, RI. As many of you know Buster has passed away since, but he definitely enjoyed his share of adventures. He was an amazing boy, and will always be missed. Beavertail State Park is a Rhode Island State Park that encompasses 153 acres. It is located at the Southern end of Conanicut Island in Narragansett Bay, and is well known for its beautiful, scenic coastline. On the site you can view the Beavertail Lighthouse, a 64 foot lighthouse, built in 1856. There even is a museum and a gift shop at the site. We visited Beavertail State Park on a warm summer day. Our time included: a hike along the coastline, wandering around the lighthouse, naps on the rocks, and dips in the ocean. We spent a large amount of time lounging along the shore, taking in the sounds of the crashing waves. In addition, we especially appreciated the uniquely structured lighthouse. Definitely a relaxing, coastal day in Jamestown. (Rating: 4). Today we visited the Blackstone River State Park in Lincoln, RI. The Blackstone River Park is a riverfront park with bicycle trails, walking paths, canoeing, and even a museum. It is also popular for fishing. The Blackstone Canal was built to improve transportation of goods, and was opened in 1828. The River flows nearly 48 miles throughout Massachusetts and Rhode Island. We visited this park on a dark, cool New England day, a far cry from yesterday’s 80 degree heat. Although many will complain about today’s weather, I love a 50 degree, sweatshirt-type of New England day.